OFFERING versatility and durability, the new EasyCoat Batter and Breading System from Heat and Control offers a functionality which will appeal to processors who operate multi-function process lines and require quick changeover times for short to medium product runs. The technology is a result of a global research and development effort by Heat and Control that relied heavily on customer input and involvement. The EasyCoat Breading Applicators apply pre-dust, flour and crumb coatings without the need for multiple machines or change parts. Uniformity of coating, clean design, quick clean out and a remote dust extraction option are features of the new equipment. With a striking visual appeal, the machines have been designed to take maximum advantage of Heat and Control's latest manufacturing technology, enabling advanced features to be incorporated whilst containing equipment cost. The coating auger transfer system incorporates the same anti-jam design as the 3rd generation heavy-duty machines (SureCoat BD-3) released previously. All EasyCoat machines are available to suit nominal line sizes from 400mm to 1000mm. Batter Applicators in the EasyCoat range are available as convertible units that can operate as dip-type applicators for tempura and other viscous batters, or as batterfall applicators for adhesive and coating batters. They can also be purchased as a dedicated single purpose machine. 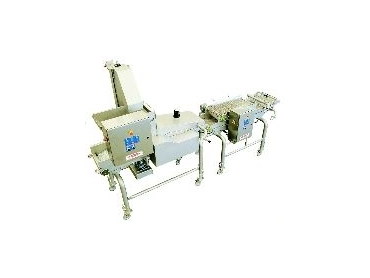 Several transfer conveyor options can be purchased to suit particular applications. Independent drives allow for rapid changeover of transfer extensions and of operating mode, at the same time drive chains and guards are eliminated. All EasyCoat machines are pre-wired and incorporate a stainless steel electrical panel with door mounted controls.